Beginner’s Guide: How do I find the right topic for my blog? Especially beginners often ask themselves the question at the beginning. What can I blog about and which topic is right for me? Here we explain how to choose the right topic and how free tools can help you choose the right topic. Which blog topic is the right one? If you just want to create a test blog to see how it works, little planning is necessary. Professional bloggers, on the other hand, want to create a successful blog and earn money with it. However, a successful blog requires thorough planning. A leisure blog can only be transformed into a professional blog with a lot of effort. So it makes more sense to create a blog professionally right from the start if you don't want to create it just for fun. Otherwise it can be very time-consuming to organize a leisure blog professionally and profitably. What content can a blog have? Depending upon Blogger, are already exact conceptions, which ranges of topics a Blog should have. However, there are also bloggers who are still undecided at the beginning or who are completely lacking ideas. So how can suitable blog topics be found? In general, the blog can have a trend theme or it is written about many topics. There are many blogs that report on current trend topics. It will therefore be difficult to assert oneself with a multitude of trend topics and the numerous blogs. If you have a variety of topics on your blog, you need special topics to be read. Therefore it is advisable to limit the blog topic and not to write about God and the world. To find a suitable topic for a blog, good practices and tips should be used. First an idea should be found. The idea must then be evaluated. Finally, the idea must be analysed. The main question is therefore what potential an idea has. In order to find a suitable blog topic, the own interests should be judged first. A professional blog should inspire the reader and of course also one over a long period of time. In the worst case the reader notices very fast, if the author of a Blogthema has no knowledge or no know-how at all to the Blogthema. You don't have to be a professional in the chosen subject area at first, of course, that comes with time. Basic knowledge is usually sufficient and if the blogger reports then still with interest and passion on a Blogthema, notices also the reader. If a blogger is very interested in a subject area, he usually searches intensively for information and can thus acquire immense knowledge over a longer period of time. So sit down at the beginning, take pen and paper and just write down all your ideas. Over the days, the first idea grows and can be fine-tuned until the concept is ready. Are the topics so interesting for me that I would like to write about them for several years? Is my blog actually a long-term project? Are the topics so interesting that they can be reported on in the long term? Is there a topic that can be written about in the long term? Is there a topic in the ideas that hasn't been reported on so often? If at least 4 of the questions can be answered with Yes, you are on the right track. It is of course difficult to predict how long the blog will last. TIP: Don't choose a topic you're not really interested in. If the blog is to run for several years, the topics about which it can be written must also be very comprehensive. Let's take the main topic "pets" as an example. An almost immeasurable topic, which offers so many possibilities, about which one can report here. Smaller, but still sufficient, would be a niche theme such as "cats". A potential blog idea should always lead to new publications and various series of articles. So don't choose a topic that is already completely exhausted after a few reports. To continue the example, the main topic of the blog "litter box" would be completely unsuitable. A relevant blog topic will still be interesting in a few years and should therefore attract readers. Blogs dedicated exclusively to one trend topic need to integrate the latest trend every year and know which topic becomes a trend. Otherwise the Blogger with numerous other trend sides goes into competition. If the new trend topics also require well-founded background knowledge, the blogger can take up a new and quick topic that may not serve the knowledge. This leads to articles that offer the reader little and are not particularly relevant to them. Google Trends offers the possibility to find out the potential of a blog topic with just a few clicks. This makes it easy to find out whether an idea offers the potential for many months or whether interest is waning. If the blog topic is very broadly diversified, one should be careful that it is not set up too broadly. The target group may not feel addressed. The same applies, of course, vice versa, if the blog idea was chosen too narrow, not enough readers can be addressed. If, for example, a "travel blog" is operated, then it should not only be written about an island. After a few posts there is probably nothing more to write. Of course, the whole world should not be reported either. It is too wide and could make the contents of the article too weak. The middle way for a travel blog would be, for example, a certain travel area like the Canary Islands and Spain. If you want to earn money with your blog, the blog potential should be found out. If the topic is still interesting or tempting to read after years, it should also be suitable for earning money. Once you have found an idea for your blog and can continue to hold this idea, it's about blog analysis. How much financial potential does my blog topic have anyway? If you want to make money with a blog, the topic should offer as many different sources of income as possible. First you should check the amount of the click prices. Google pays click prices when using AdSense. Whether these click prices are interesting also depends on your expectations. The keyword planer from Google can ideally be used here as a free search tool. In the case of the travel blog and the keyword "Canary Islands", the click prices are about $2.00 on average. In so-called affiliate networks a user can register for free and find out whether there are partner programs for a topic area. Partner programs can best be integrated with our WordPress plugin monkey - The ultimate affiliate tool. TIP: In this article we have already listed potential sources of income for bloggers. The idea or blog topic should lead to a high search volume. This means that many readers should be interested in the blog. Only then can the blog be successful. Simply enter your ideas and topics in Google Search and you will quickly get an overview of the number of search results. There should be at least one million search results for this idea. 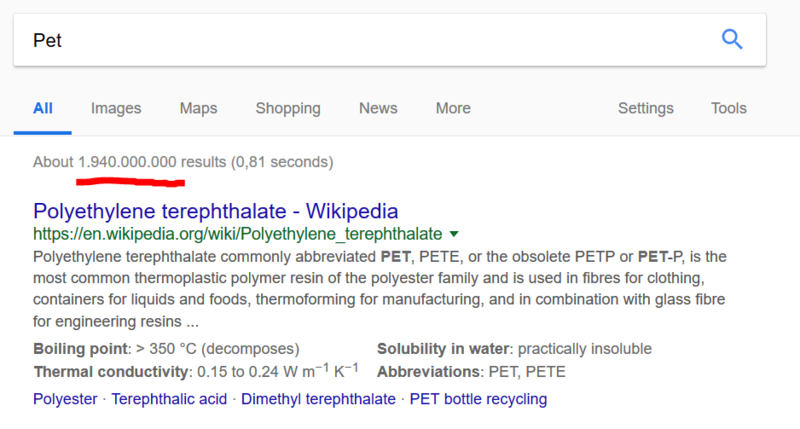 For example, more than 1.94 billion results are displayed for "Pet". However, too large a search volume should also be excluded. If billions of results are already available, a blogger can hardly get to the first Google search page. It is advisable to look not only at the search volume but also at the competition. A blog idea should not be too crowded and should attract too many competitors. After all, the blog should preferably end up on the first Google search page. In the case of a travel blog, one would find many competition sides to the topic Mallorca. Less so in the Canary Islands and Spain. Mallorca could then be listed as a section of this blog. The travel blog can then also be found under the search term "Mallorca". Which blog topic is interesting for you, whether a blog is worthwhile, depends entirely on your expectations. If you want to earn money with a blog, the blog and the subject areas should be developed as professionally as possible. This also includes in-depth background knowledge of the topics you want to write about. You should also research click prices and partner programs before you start blogging. It is also advisable to choose a subject area that is of long-term interest to readers and that cannot provide any more information after 10 to 20 articles. If you only want to have fun with a blog, the above mentioned effort is usually not necessary, then you don't need to plan so much. However, it is difficult to turn a leisure blog into a professional blog. Therefore, before creating a blog, you should think carefully about your goals with this blog.